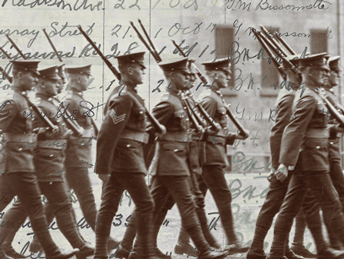 Archiving Our Military Heritage – see how you can help with this ongoing research project! The Norfolk Remembers Committee is currently working on archiving documents, photographs and other related research material on individuals who served in both the First and Second World Wars from Norfolk County. Pte. George Sherlock of St Williams died on Feb 28, 1919 from effects of gassing. He left behind twin sons named Eric and Allan. They were much more than just a legacy. Prior to WWII, The boys ran a fish shop in Delhi, next to Caffery’s Hardware. They were forever playing pranks. One time they set all the alarm clocks in the hardware store to go off at different times. 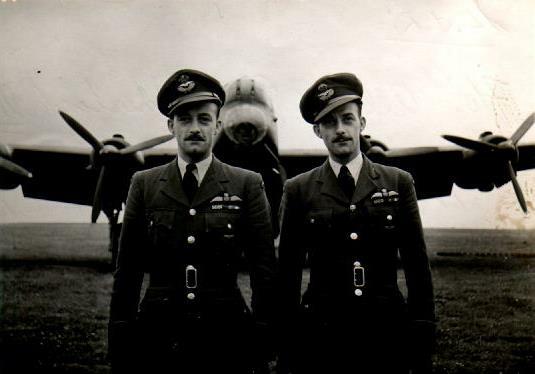 Both were pilots flying for Bomber Command and both received the Distinguished Flying Cross. Allan went on to be the aide de camp for the Governor General. SHERLOCK, F/L Allan Arthur, DFC (J15488) – Bar to Distinguished Flying Cross – No.427 Squadron – Award effective 6 January 1945 as per London Gazette dated 16 January 1945 and AFRO 508/45 dated 23 March 1945. Recommended in October 1944 when he had flown 48 sorties (281 hours 25 minutes). First tour was 10 July 1943 to 5 October 1943 (29 trips, 182 hours 30 minutes) of which all but one were in the Mediterranean (No.331 Wing ?). Second tour was 18 August to 14 October 1944 (19 trips, 98 hours 55 minutes) when recommended. This officer has completed an outstanding operational tour. Since the award of the Distinguished Flying Cross he has completed many sorties against major targets in Germany and enemy occupied territory. He has proved himself a fine pilot and an enthusiastic and resourceful captain of aircraft. Flight Lieutenant Sherlock’s determination, coolness and fearlessness in the face of danger have set an excellent example to his crew. SHERLOCK, F/L Eric Thomas, DFC (J15489) – Bar to Distinguished Flying Cross – No.427 Squadron – Award effective 6 January 1945 as per London Gazette dated 16 January 1945 and AFRO 508/45 dated 23 March 1945. Recommended in October 1944 when he had flown 46 sorties (279 hours). First tour was ops from 5 June to 4 October 1943 (28 trips, 186 hours 15 minutes), all but one sortie in the Mediterranean. Second tour was, when recommended, 18 trips (92 hours 45 minutes), 18 August to 16 October 1944. Since the award of the Distinguished Flying Cross Flight Lieutenant Sherlock has completed many more successful sorties against targets in Germany and enemy occupied territory. His work has been of an excellent standard and his ability to make instant decisions in emergencies together with his skilful pilotage and cool judgement have been an inspiration to his crew. He has displayed fine qualities of skill and leadership. His courage and devotion to duty are worthy of high praise.